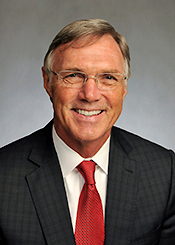 John Sherman is President and CEO of Coca-Cola Bottling Company UNITED, the second largest privately held Coca-Cola bottler in the U.S. and the fourth largest overall in North America. Under John’s leadership, Coca-Cola UNITED recently completed a multi-year expansion that more than tripled the size of the company. Today, Coca-Cola UNITED has more than 60 facilities throughout the southeast in Alabama, Louisiana, Mississippi, Georgia, Florida and Tennessee, and employs approximately 10,000 associates. John has been with the Coca-Cola system for almost four decades. In 1979, while still enrolled at Georgia Tech, John began his Coca-Cola career as a part-time Clerk in the accounting department of Atlanta Coca-Cola Bottling Company, which was then a part of Coca Cola Enterprises, Inc. He advanced to positions of Department Manager, Cold Drink Manager, Home Market Sales Manager and Sales Center Manager for the Atlanta market. In 1987, John was promoted to Region Manager, responsible for the Alabama and South Georgia bottling franchises which belonged to Coca Cola Enterprises, Inc. In 1990, Sherman joined Birmingham, AL-based, Coca-Cola Bottling Company UNITED, as Director of Marketing for the East Region, based in Augusta, GA. In 1993, he moved to Birmingham as Central Region President, responsible for the Birmingham and Chattanooga, TN, market territories. In 1999, Georgia and South Carolina were added to his responsibility, and he was named a Corporate Vice President and President of the newly-formed East Region, which included Birmingham, Carbon Hill, and Cullman in Alabama; Chattanooga, Tennessee; Augusta, Brunswick, McRae, Milledgeville, Savannah, Statesboro, and Waycross in Georgia; and Spartanburg, South Carolina. In 2013, as the company embarked upon a major territory expansion, John was named Corporate Senior Vice President and Chief Commercial Officer, responsible for leading the reorganization of Coca-Cola UNITED’s legacy operating units and overseeing the transition and integration of all new franchise operations, current and future. In this role, he was also responsible for Commercial Leadership, Operational Marketing, and Customer and Revenue Management across Coca-Cola UNITED. In April 2016, John was named President and CEO. John has also held executive roles within the beverage industry including President of the Alabama Soft Drink Association (now Alabama Beverage Association) for an unprecedented two consecutive terms, from 1999 to 2005. He currently serves on the Board of the Dr Pepper Bottlers Association. In 2005, John received the Alabama Beverage Association’s Distinguished Service Award – the highest honor bestowed by the state’s soft drink industry. In 2016, under John’s leadership, Coca-Cola UNITED won the inaugural and prestigious Market Street Challenge award from The Coca-Cola Company, recognizing the organization’s top executional excellence among all U.S. bottlers. In the community, John serves on the Board of Advisors of the Brock School of Business at Samford University, and on the Board of Directors of both the Alabama Sports Hall of Fame and St. Vincent’s Foundation. In 2018, he received the “Top CEO” award from the Birmingham Business Journal and was also named an “Executive of Influence” by that same publication. John’s hobbies include golf and hunting, and he is a member of Briarwood Presbyterian Church. John and his wife of nearly 40 years, Terry, have three grown sons, Jack, Bobby, and Keith, and delight in their four grandchildren.